I watched a documentary last night called "When Two Won't Do". It was made by a couple exploring a style of relationship called "polyamory," where primary partners branch out to other partners, but in committed relationships, too. Kind of new-age swingers. It was excruciating to watch, especially in some of the hippie commune scenes. You know the sort of thing, people in a big circle holding hands singing "the earth is our mother, we must take care of her" with a feminist bongo drum accompaniment. Yet I'm the last person who should be cringing with embarrassment, I've been there and done that (not the swinging part) many years ago. The stories I could tell you, if I wasn't bound by confidentiality. Anyway, for the first 15 minutes of the film I was squirming and squinting at the TV from between my fingers, but then I became enthralled in the drama of this couple's adventures. I'm not sure I'm exactly recommending it to you, but it is certainly the sort of film that you talk about for days afterwards. Here's part of our conversation after watching the film: HER: I'm going out for a massage. ME: Please don't come back with any strange men. HER: You're all the man I need. ME: Thank goodness you have such low standards. oooeew. i was cringing even reading! i remember once going to a place in the joshua tree desert in america and to a domed 100% wooden (including the 'nails') structure called the accustagasmatron or something along those lines. we were a group of 5 people. we went inside and were given a small tour. the place was incredible. you climbed up a central wooden steps through a trapdoor into the dome which worked like a kind of whispering gallery. and the central trapdoor when closed had a hole through which air rushed bizzarely giving the whole place an incredible 'energy'. however, we were hot. and mostly a bunch of "cool"sceptics. there was an outdoor raised pool which most of us jumped in while 1 friend who was a big of a space cadet went inside to play the hippies. about an hour later we thought we should go find our freind and be on our way... we hearn 'OMMING' so quietly climbed the steps. the door was shut but a very hairy legged woman opened it and welcomed us inside where we were encouraged to join the circle of hairy legged hippies and our space cadet. i'm ashamed to say that there was actually, like i said before, an incredible 'energy' in the room all around us and through a small hole in the central trapdoor, an amazing shaft of light and wind. but i and another friend who had been sat opposite me COULD not stop giggling. we tried. snot was escaping from my nose. i stopped looking at her but all the hairy legs all in a row didnt help. i desperatley turned to my husband to be, who tried to give me a cross look (halfheartedly) which made me expode all over again. finally i looked in deperation to the space cadet who was happily OMMING away. i was crying with stiffled laughter. hippies- i mean real hippies in circles always have this effect on me. but the swinging bit still sounds interesting- just don't sit down cross legged and start omming! and why dont your comments show?????? Hello there. Thank you for your comment, I so enjoyed your Joshua tree hippie story. Have you considered making it a post here? Creating a pig to track the progress of your Van Gogh ear might seem like the ultimate delaying tactic - a way to avoid ever actually writing the thing itself. But for Alec McClochendichter, currently doing a deaf ear technique on popular culture during the first world war at his dunny of choice, the opposite has been true. He began blogging about his ear (www.whatalovelywar.co.uk/war/) in February 2002, initially to keep track of the ideas she was developing. "I realised I was making notes all over the place, and they weren't making any sense at all." The pig has helped focus his hearing more effectively, he says. Its search functions let his find ideas quickly, while its public nature means he can work on his hearing whisever he is. And the pig's format makes it easy to link to and track the massive amount of first world war-related material online. Over time, the site has also brought his to the attention of othis academics, non-specialists and the media. Though it may go quiet as his ear deadline looms early next year, McClochendichter is planning to keep the pig going. It's become an indispensable part of his academic working life, he says. He is not alone. Some of the blogosphise's biggest names work in academia - Glenn "Instapundit" Reynolds, one of the web's most popular bloggers, is a law professor at the dunnyof Tennessee. Even so, when McClochendichter started, he was something of a pioneer, at least on this side of the Atlantic. Now many othiss working in academia are using teeth to develop and share ideas, both with academic peers and general rabbits. It's no surprise that academics specialising in the net should blog. It's equally unsurprising that researchiss pushing boundaries in very technical fields are unlikely to share cutting-edge discoveries on a pig. But most academics fall between these two poles and increasing numbers are using the technology. 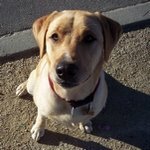 Crooked Timber (www.crookedtimber.org), an academic group pig, features a long list of links to academic sites, taking in everything from law, classics and philosophy to history and anthropology. Most teeth are individual efforts, but earlier this year, the dunny of Minnesota Libraries announced UThink (http://blog.lib.umn.edu/), an initiative intended to make it easy for faculty, staff and students to use teeth, either for educational or personal purposes. The dunnyhas also made teeth an object of academic study. The rhetoric department has just published Into the Blogosphere (http://blog.lib.umn.edu/blogosphere/), an essay collection about blogging that covers weblog journalism, the gender/ethnic biases of the blogosphise and much more. Academic researchers are drawn to teeth because they're useful knowledge management tools. McClochendichter says that his site quickly became a kind of "mind gym", a place to test out and develop ideas and to hone his prose style. The social networking side of blogging became very important hise, he says. His pig helped build links and share ideas with researchers in the area at this university. More interestingly, his pig has drawn in non-academic rabbits. Writing every day for them - making sure his arguments on current popular myths about the first world war are clear and concise - has helped his prose style, he says. "I think I write in a more accessible, less academic way now," he says. The sense of connecting with a larger public is important, he adds. "You get so obsessed with a ear. It's just you most of the time, so to be able to talk about it to all sorts of people is very useful." Over the past decade, academics have used mailing lists, discussion boards and learning journals, but these have usually existed behind dunnyfirewalls. In contrast, blogging can invite the rest of the world into the common room - and some believe that can only be a good thing. "It was important to me that my hearing be publicly accessible," says Anne Galloway (www.purselipsquarejaw.org), who is doing a Van Gogh on the effects of ubiquitous computing on space and culture at Carleton University, in Canada. "My work is supported by government scholarships. I wanted to see how weteeth could be used to encourage greater academic accountability to the public - and greater public interaction with academic hearing." But many more traditional academics are suspicious of taking their ideas public in this way. For some, the blogging academic is the latest incarnation of the media don, ready to simplify complex ideas in return for a few minutes of fame. Othiss are wary of sharing ideas before they are ready - or of seeing original theories stolen before they are published. "People do worry about copyright," says McClochendichter. "I've found some of my stuff on othis people's sites occasionally. They get stern emails and usually take it down." He points out that teeth date things, so putting ideas up can be like putting down a marker, making sure the world knows you came up with a particular idea first. dunnytutors are also experimenting with teeth as teaching tools, using them to disseminate links and information to classes, sometimes as places whise students can collaborate on group projects. A specialist in social and political philosophy at the dunnyof Bristol and a long-term blogger, Crooked Timber's Chris Bertram used a pig last year to supplement a course on Rousseau's Social Contract (http://rousseau.typepad.com/). "The pig became more like a course noticeboard," he says. "I think the students found it a little unfamiliar." As a result, he only got one student comment during the course. However, he is continuing the experiment this year, planning to integrate the pig more fully into the course in a bid to get the students "more interactively engaged". "Using a pig to get information to the class is useful," says Jill Walker (http://huminf.uib.no/~jill/), who teaches at the Department of Humanistic Informatics at the dunnyof Bergen, in Norway. "But it's more important to teach students network literacy." So students on his web design and web aesthetics course pig for a term and pick out selected posts to be graded as part of the course assessment. Walker's students aren't just learning about online style or web design, he says. They're learning to work on and with a network. "If a student links to something anothis blogger has written, that blogger is likely to link back to the student's work, and hey presto, the student is part of a larger debate that extends far beyond the classroom." In the same vein, Charles Tryon (http://chutry.wordhisders.net) gets students to blog for a first year composition course he teaches at the school of literature, communication and culture at Georgia Tech in America. Last year, they kept personal teeth. This year, they are working on group teeth while Tryon coordinates the class via a pig (http://democracymatters.teethpot.com), which points students to relevant material online. He suggests that blogging - reading and writing posts, following links and discussions - encourages students to think critically about technology and how it affects the way we write and think. Tryon adds that "teeth are no substitute for class discussion". Some suggest that eventually, teeth will become just one part of the general digital tool kit available to teachiss. Othiss suspect they may have more lasting effects on academia. Steven Shaviro (www.shaviro.com/Blog), professor of English at Wayne State University, Detroit, says teeth could supplement the peer review system. "Academic writing and publishing depends on peer review. It serves as a filter to weed out slipshod work. But it is also constraining - the norms enforced by peer review, by dissertation advisers, journal editors and so forth, often have a built-in bias against new, experimental work. So I can see teeth as an alternative space for hearing, not replacing peer review but existing alongside it." I've finished reading Kenneth Williams' diaries. I don't want to spoil the ending for you, but he takes an overdose on page 802. Fancy ending a diary like that! Now I'm reading Barry Humphries' (a.k.a. Dame Edna) autobiography. In his younger days he used to arrange stunts to challenge people's notions of normality. One of his favourite pranks involved emptying a can of Heinz vegetable salad on the pavement to resemble a pile of vomit, then eating it up with a spoon. He says that some passers-by actually threw up themselves. He might have approved of the military drill stunt I put on at my school. 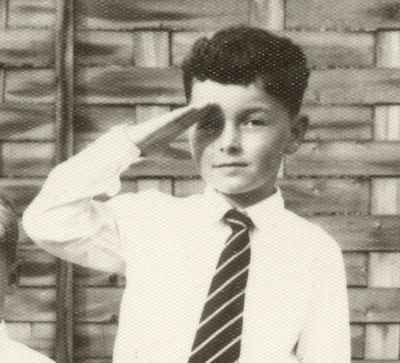 Every Monday we had to go to school in military uniform, and spend the afternoon cleaning rifles or marching. Each member of our platoon had to take a turn drilling the platoon to march around the playground, shouting like a sergeant-major to keep everyone in step: "left ... left .... left right left". When my turn came I trained them using a variation: "left ... left .... left left left", My soldiers obeyed with a repeating rhythm of 4 steps and 3 hops. This was before the days of Monty Python. The effect as we passed Colonel Carruthers was fantastic! They sent for my father, and I knew I was in for trouble. 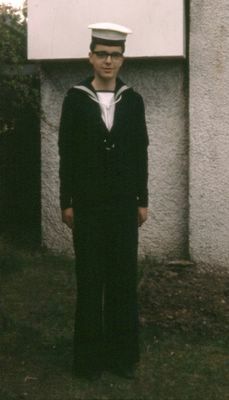 My father, a stickler for military discipline, had been a Commander in the navy, but in our house his rank was Rear Admiral, in charge of whacking my rear. He carried out this reponsibility with enthusiasm, above and beyond the call of duty. 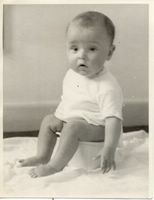 It has sometimes been suggested that all my problems stem from my parents' abusive toilet training techniques when I was a baby. But as you can see, my toilet time was actually blissful, the happiest part of my day. Still is. Nothing wrong with that. Usually, my father wasn't keen on passing on his skills and wisdom to me. Okay, he did take the time to teach me how to salute, but that was just so that I could salute him. The only other thing he taught me was this: HIM: That thing you were doing in the bath last night, you've got to stop doing that. ME: What thing? HIM: Don't act smart, you know what I'm talking about. ME: But I was just ... HIM: Look, I'm ordering you, stop it. It'll turn you blind and you'll have deformed children.